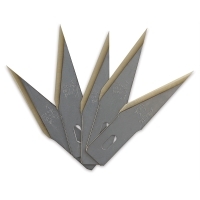 X-Acto Blades are available in various quantities, from sets of five to bulk packs of 500. The packs of 15 blades come in a safety dispenser. Choose from different styles to suit your cutting needs. Z-Series Blades — Designed to be the absolute "best in class," Z-Series Blades are seven to 10 times sharper than standard X-Acto blades. A zirconium nitride coating on the cutting edge adds significant strength, particularly at the tip. Available in #2 and #11 styles. Utility Blade — This blade fits the Ergo Dual Utility Knife, SurGrip Utility Knife, Quick Change Utility Knife, Interlock Utility Knife, and Plastic Utility Knife. #9 — This fully retractable blade is an excellent for making precise, detailed cuts through a range of lightweight materials. It's thin enough to make careful cuts, but also sturdy enough not to snap under light pressure. Precision Blade Set — This set includes one #10 blade, two #11 blades, one #16 blade, and one #17 blade.